Why is lobster so damned expensive? And where can you get a three-course lobster meal for €18.95? A lobster dinner is a great choice for a special occasion or a romantic dinner, but it’s not so good for your pocket. Here on the Orihuela Costa, it’s common to pay between €40 and €50 for a lobster menu – with starters and desserts on top of this. Our popular Ultimate Surf and Turf (an 8-ounce fillet served with fresh lobster thermidor style) is €49.95 – which, including starters and mains, is great value for money. But this January, we’re offering a three-course lobster, steak or chicken meal for just €18.95. More about this in a moment. First, why is lobster so damned expensive? When figuring out why lobster is so expensive, science has the answers. Firstly, lobster farming is nigh on impossible; especially to make it commercially viable. Lobsters eat a lot, but grow slowly. Commercial fish farms would need to supply an awful lot of food to feed lobsters. Therefore, wild-caught lobsters are the major source of lobsters for the table. It is not only the difficulty in farming lobsters and reliance on wild-caught lobsters that makes them expensive. They also need to be shipped after they have been caught. This means that they must be kept alive during shipping – they must be kept cool and moist, but out of water. They shouldn’t be kept on ice that is likely to melt, either, because fresh water will cause lobsters to swell and maybe even explode. Lobsters also need ‘breathing room’ around their containers and in them – they rely on oxygen to live. So, lobsters have to be handled carefully when being shipped and must be shipped fast to remain fresh. This adds cost. As does the fact that some of the lobsters are likely to arrive dead and therefore no good for the plate. As we discussed in our article ‘How to buy, store and prepare fresh lobster’, fresh lobsters are the best to serve, so when we buy lobsters we make sure they are fresh – food processors tend to buy the least fresh lobsters. Lobsters can travel hundreds or even thousands or miles while making their way to your plate, and they travel through many hands. First, of course, is the lobster fishermen. Then the wholesaler, shipper, dealer, live market, and then on to the restaurant or store. Each of these people in the chain needs to be paid – and this is even more cost added to your lobster dinner. So, there is the cost to fish, the cost to ship, the cost to market, the cost to wholesale, and the cost to supply to the end user. Plus losses of lobster through the process. Is the experience worth the expense? 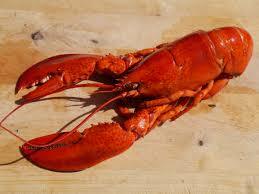 Lobster is a luxury food, and therefore enjoyment is often linked to expense. To enjoy the best, you are likely to pay premium prices. Unless, of course, you find a local restaurant that has struck an exceptional deal with their supplier to ensure quality at an extremely competitive price. And this is exactly what we have done for January. What are you waiting for? Call Christopher’s on +34 600 01 28 24 to reserve your table today and kick off 2019 with a real treat from one of Torrevieja’s best fine dining, mid-price-range restaurants (as reviewed and rated on TripAdvisor).